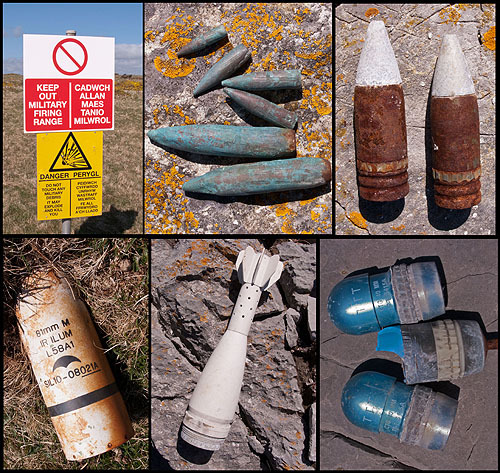 The signs at Castlemartin "Range East" are clear . Do Not Touch any unusual debris. Most military items are cleared after training , but If you walk near the cliff edge , the items in the pics might be encountered. Photographed between The Castle and Mewsford Point. Pic 3 - 2 rusty - 30mm Target Practice Rounds (Blue) ,as used in the Chain Gun of the current attack Helicopters ?. Pic 4 - The top half of an 81mm illuminating Mortar Round. Pic 5 - The bottom half of the smaller 60mm illuminating Mortar Round. These rounds deploy a parachute with an attached flare. Pic 6 - 2 types of 40mm Grenade Training Cartridges (Blue Tip). The centre one produces red smoke on impact ?.